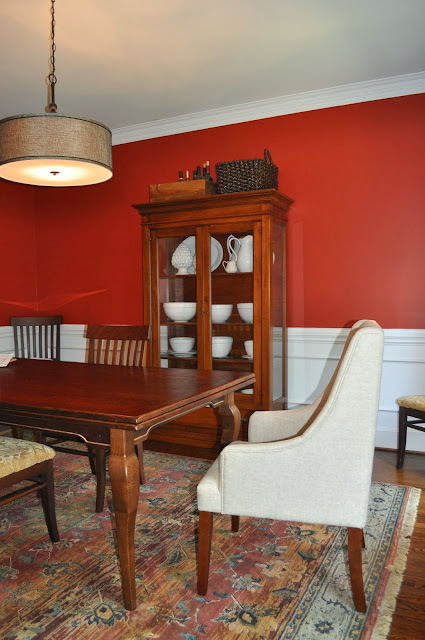 Hey guys, I featured our updated Red Dining Room last week - if you missed it click here. And even got a shout out from the blog Be Colorful, such a nice surprise! But as I reread the post Friday night, it dawned on me that this makeover still isn't finished. Yes, I updated the room with some great new lighting. But our dining room chairs are looking majorly dated, especially with this gold damask fabric, which I will be changing - like now ;) Our dining room table is a quality set from Arhaus Furniture that we purchased almost 15 years ago. The table opens up to be double the length shown seating 10, and the entire set is still in great condition. So here's my question - what do you do when quality furniture goes slightly out of style. Do you sell it for way less than it's still worth? Put it in the attic and buy new furniture? Just live with it? Well I say update it with a few new affordable pieces! Ahhh, I am in Love with this chair! It's just what this space needed, some cool contrast and softness to break up the sea of wood we had. Also, I'm really impressed with the quality of this chair. And I love the subtle mid century modern design. Two of these are perfect for our Eclectic Dining Space. Looks great Jane! 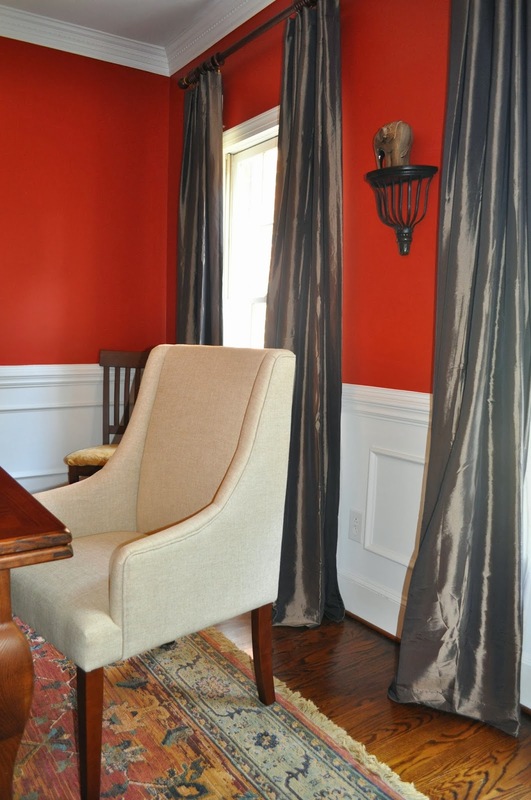 I did the same for my Dining room - upholstered head chairs from West elm then ghost chairs for the rest! It's coming along nicely. I love the addition of the new host and hostess chairs. Thanks, yes they will be so comfy come Thanksgiving! Jane that is such a great way to update your dining set!! I love host chairs and those ones have such great lines!! Great find. Also your blog is looking so pretty and fresh too! Thanks, they do have great lines don't they! I also love the subtle textured linen fabric. I love mixing and matching decades/ styles so I would keep a few chairs and grab some new ones like you did. Love it! Thanks Melissa, even my hubby loves the change! Thanks Brooke, the chairs really are awesome. I was skeptical about their quality at first, but they have some great detail and are well made. 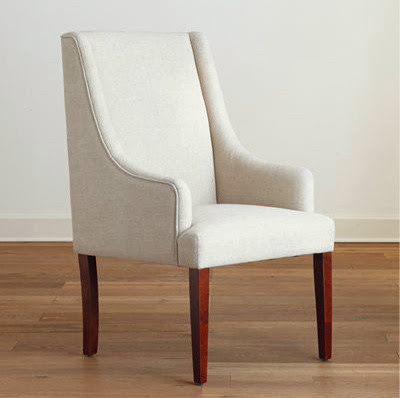 Jane, great chair to add to the dining room - makes it warm and cozy. 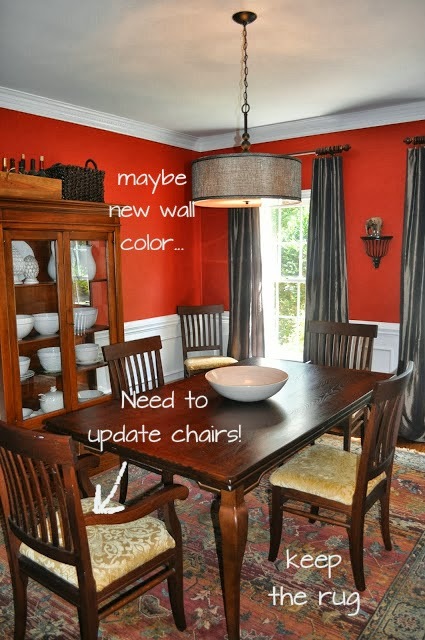 Can't wait to see the end result when you're all done with your redecorating project! Thanks Sharon, unfortunately the hubby and I can't get motivated to paint! Promise to get that done soon! !